.Basics | Can't Believe It's Allergy Free! Ghee is a super food! Good fats are integral to our health—almost 30% of total calories in our diet must come from fat. Ghee contains vital, essential fatty acids, the Omega 3s. In a zero- size aspiring culture, fat has become synonymous with”bad for us”. Ghee, when it is a by product of organic milk (milk from grass fed cows, raised without hormones or antibiotics), is rich in Omega 3 fatty acids. Traditionally made ghee lubricates joints and tissues, cleanses intestines and arteries. It improves hormonal function and digestion. It boosts the immunity and the Omega 3 fatty acids in it have a calming influence on an over active immune system. Ghee also contributes to creating a better ratio of HDL to LDL cholesterol, and helps control triglycerides. Ghee which is made traditionally (recipe follows), with organic butter, is often included in the diet of dairy allergic people. As always, introduce with caution. For an absolutely ‘yum’ taste, use a small dollop of ghee to enhance flavors when making dairy free dishes which have to be cooked in water/rice milk/soy milk. Try it with rice and tapioca puddings, Indian sweets such as carrot and other halvas, and even use it as a much healthier alternative to margarine in baked goods. It is healthier than butter and tastes great in Western / American style cooking. Ghee,like other fats helps to lower the glycemic index of sugar In other words, it helps to metabolize sugar slowly and prevents a ‘sugar high’ in the system. (An oatmeal cookie actually has a lower glycemic index than a bowlful of breakfast oatmeal) Add a level teaspoon of ghee to oatmeal when cooking it with water, sprinkle a little cinnamon powder and serve—just delicious! Ghee made the traditional way, at home, is most beneficial to health. Grandma added yogurt culture to milk fat, churned it into butter, then boiled the butter to make ghee. She also added a big helping of loving care along the way. The only shortcut to home made butter is store available organic, unsalted white butter. There is a big difference between homemade ghee, and the so called ‘pure ghee’ available on store shelves. Most of the time, commercially made ghee consists of hydrogenated vegetable oil and heated milk fat without the use of active cultures. Melt 2 cups home made or store bought unsalted, white organic butter in a saucepan. Once melted, allow butter to simmer gently. After 5 minutes or so, foam will rise to the surface. Do not remove or stir the foam. Let butter cook till foam thickens and settles at the base of the pan. There will be a continuous crackling sound as the butter boils. Once the foam caramelizes and turns into a brown sediment, butter has turned into ghee. You will find that the liquid is a golden color and is now boiling silently, with just a trace of air bubbles on the surface. Remove from heat. When a little cool, pour the liquid, using a strainer, into a clean, dry container. The strainer ensures that no trace of sediment enters the final product. Although ghee lovers like to add sugar or jaggery to the caramelized sediment and eat it like a rich snack, it is not meant for the dairy allergic. Once you taste home made ghee, you will never be able to settle for any thing else! Books, websites, articles from reputed magazines and newspapers are great sources of information. Here are some that have given me useful and invaluable information about allergy and nutrition. Articles by well known nutritionists from different parts of the world also help to increase knowledge and understanding. Websites are too many to enumerate. There are several Allergy related websites, and guidelines put out by USDA, NIH, and ADA which have good and reliable information. Imagine meals with meats and no potatoes—no mashed or baked potatoes on the side, and no French fries at all! What on earth did people do before the potato was discovered? According to some sources, the potato was introduced to England in the latter half of the 1500s, even though the known history of potato cultivation probably began nearly 2000 years ago in South America. The popularity of the potato has grown over the years. It is so nutrient dense that some call it a near perfect food. The USDA tells us that a diet of whole milk and potatoes would supply all the elements necessary for the maintenance of the human body. The potato is high in nutrition and low in calories, and with its high water content, makes a filling bulk food. The average baked potato provides the recommended daily requirement of Riboflavin and Niacin, both B group vitamins.. It is rich in iron and Vitamin C.
It contains more potassium than a banana. A medium sized baked potato has as many calories as an average sized apple. It has 2 ½ times fewer calories than a similar quantity of bread. (88 calories in a medium 4 oz. potato). By itself, the potato is not fattening. High fat toppings add to the calories. Most important of all, it is one of the least allergenic of all foods and can substitute for grain / cereal accompaniments at the dinner table. When buying potatoes it is important to choose firm, dry potatoes with unbroken skins. Potatoes should be free from sprouts and green patches. Uneven surfaces or eyes do not cause harm. Always store potatoes unwashed in a cool, dry place. Potatoes should never be stored with onions which can speed their spoilage. New potatoes do not keep as well, and should be bought in small quantities. Potatoes should not be refrigerated. Only new potatoes can be kept in the fridge. Pressure cooking is an excellent way of retaining nutrients. It requires the use of minimal water which can easily be used up. Cooking in the microwave oven is yet another good method of maximizing on the nutrients. It is best to undercook, test for doneness, then cook further if necessary. Yogurt is the best probiotic that we can include in our daily diet. When derived from active cultures, yogurt maintains and improves the balance of different kinds of bacteria in the intestines. Apart from improving overall digestion, these friendly bacteria help to synthesize some of the B group vitamins and Vitamin K.
Antibiotics and painkillers can destroy friendly bacteria, and it is especially important to repopulate the gut flora with these, by ingesting plenty of yogurt. Lactobacillus is the most important component of friendly bacteria. Yogurt converts lactose (milk sugar) into lactic acid, thus making digestion easier. Lactose intolerant people can usually have yogurt without any problem. Well known nutritionist Marion Nestle recommends trying hard cheese and yogurt, as “the friendly bacteria used to making these foods have already digested most of the lactose they contain. However, caution is the key word here. Studies tell us that not only are the proteins in yogurt more easily digestible, but also its micro components such as calcium and phosphorus are more widely and immediately available to our bodies. Research shows that our bodies absorb twice the amount of calcium from yogurt than from milk. The “Complete Food and Nutrition Guide” brought out by the American Dietetics Association (ADA), states that yogurt is one food that is a must for children, the elderly and for people recovering from illnesses. and that it can even prevent allergy symptoms. Regular yogurt supplies considerably more calcium than frozen yogurt. No federal standards exist for frozen yogurt. Very low temperatures in frozen yogurt slow down the action of any live cultures. It is best to have yogurt as a snack rather than at the end of a meal. Never leave fresh fruit in yogurt for longer than half an hour. Add cooked fruit to yogurt if you wish to make fruit yogurt. That Ancient Egyptians preserved milk in containers made from animal skins, while in Mesopotamia milk containers were made out of dried gourds. 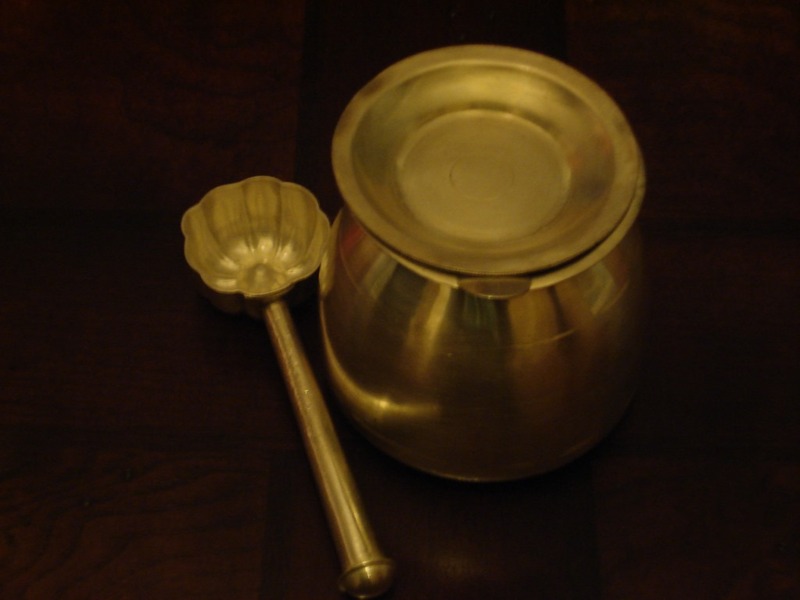 In India, the earthen pot is considered as the best to use for yogurt. That yogurt is made everyday at home in many cultures. In India people make yogurt by adding a small quantity of the previous day’s yogurt to warm milk, and keeping it in a warmer corner of the kitchen for about 4 hours, till it is set and ready to eat. Yogurt culture can now be bought in stores, but where and how the first few spoons of yogurt were obtained centuries ago is a story that is lost in the mists of history. That when bought from stores, we need to ensure that yogurt is made from live cultures certified by the National Yogurt Association.